Propeller Anime: Next Propeller Anime Club meeting on Sunday, October 10th! Next Propeller Anime Club meeting on Sunday, October 10th! Next club meeting will be on Sunday, October 10th at 1:00pm at Full Sail University! Since there will be an open house on campus, we shall go into hiding at FS3F-112, in the building closest to Wendy's and Winghouse. It's made of bricks. 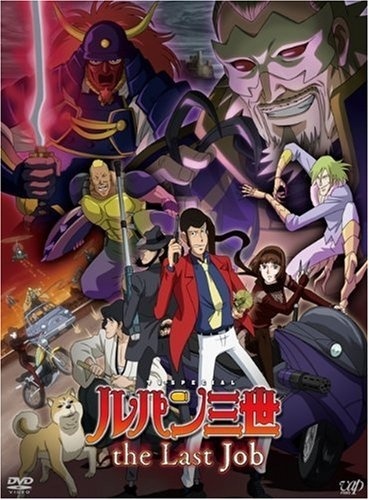 Our feature showing will be the much talked about television special that aired in Japan earlier that year, Lupin III: The Last Job! I haven't seen it yet but Lupin and his usual friends are trying to steal a treasure. (I'm just as surprised as you are!) But so are ninjas! Zenigata, the inspector that always tries to capture Lupin, may or may not have been killed by said ninjas. It's Lupin III so chances of it being awesome are pretty high! In addition, we'll be showing episodes 3 and 4 of Jojo's Bizarre Adventure. With his mother's life on the line, Jotaro Kujo and his grandfather Joseph Joestar, along with Advol and Kakyoin head to Egypt to kill the vampire Dio Brando, who not only has the body of ancestor Jonathan Joestar, but is the root of the deadly illness Jotaro's mother faces! The trip will not go as planned and the party will learn that enemy stands can do just about anything and wielded by just about anyone. (Well, anyone that can posses stands.) The series will soon live up to its name as a bizarre adventure! In episodes 9 and 10 of Black Lagoon, Revy will swear a lot and shoot people! Actually, they were delivering a package in the form of a child of a wealthy family to be sold to a Colombian cartel. Except Roberta, the family's maid who's actually a KILLER SUPER SOLDIER ASSASSIN CHICK, will have something to say about that! Lots of excitement to look forward to! Hope to see you all on the 10th!